Good resources on traditional martial arts, let alone Okinawan karate, are a hard find these days. With the influx of sportive and new fangled modern systems devised by self-appointed "masters" it seems the techniques and values of karatedo have been lost, or worse, misunderstood by one generation after another with the administering of so-called "improvements" leading to an aberration of the survival arts of Okinawa that have been passed down through antiquity. 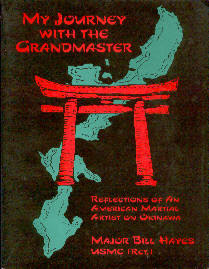 In his book My Journey With The Grandmaster, retired Major Bill Hayes recounts his experiences in karate training while stationed on Okinawa as a US Marine following a tour of duty in Vietnam from 1966 - 67. There, at Camp Hansen, Okinawa, he encounters Eizo Shimabukuro, 10th dan in Shorin-ryu karate. Hayes Sensei describes in fascinating detail his metamorphosis from a slightly full-of-himself "jarhead" to a dedicated and humbled student under the Grandmaster. While he was awed by the unbelievable skill and deadly proficiency of his teacher, the OSensei nonetheless possesses the compassion and wisdom one would expect from a master of any stripe. The book is filled with thought provoking, mystical, and at times amusing tales relating to the maturation process necessary for one to embark on the karate path. The author explains that an in-depth understanding of Okinawan culture and history is imperative to appreciate karate's original intent as a bugei system (combative or "life protection" art). In summation, Journey's formula for karate mastery as a way of life requires nothing less than a strong moral character, duly recognized high skill level and optimal health through proper training and nutrition. For Hayes Sensei, the way of the empty hand is a never ending path, as he still regards himself an "Old Student" under the Grandmaster. *For those interested in purchasing a copy of "My Journey With The Grandmaster", kindly contact the author at oldstudent1@cox.net. Hope it ain't to expensive. Just checked Amazon and since it is out of print there is one used copy for about $75 bucks. Thanks for the email as I will contact him. No, not expensive at all - much less than Amazon. My copy is the 6th printing which just came out. "oldstudent1@cox.net" if you'd like a copy - I wouldn't want anyone to even think about spending $75.00 for a copy from Amazon. The email address you provided was bounced back. Is there by some chance a typo? Check my post again, I made the correction to the email link. Great review of Hayes Sensei's book! The more people that get access to this work the better. Thanks Matt. There's very few books of this kind that are available, especially those written from personal experience. I liked your blog a lot! Realy very good! I've a blog too, but it's in my mother language, portuguese. I got the book yesterday and although I have only read the first couple of chapters I wanted to let you know that the book is excellent. Thanks for the reference. Oh, by the way Burris Sensei of Tennessee lineage has a book out called, "The Last Lesson," in case you want to check it out. If you wish to read my thoughts on it I made some comments on my kenpo gokui blog site. No problem, Charles. I'm glad you like Sensei Hayes' book, though I'm not surprised. And thanks for that reference to the Isshinryu book, I might just check it out.